Here’s a photo I took on the street in Wilmington. It’s a portable shrimp/fish seller operating out of the back of a pickin’-up truck. 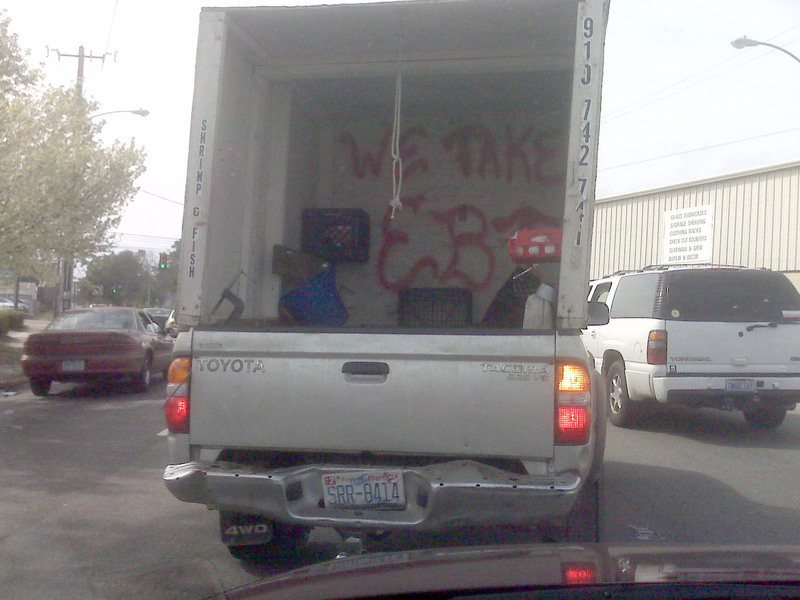 In case you can’t read it, the sign inside (spray-painted on plywood) says “We take EBT”, i.e. electronic bank transfers. Unfortunately this was on a busy street, so I didn’t have time to stop and buy some srimps. January 2013: It seems I was wrong about the meaning of EBT. It probably means Electronic Benefit Transfer, the successor to Food Stamps. Oops! Thanks for letting me know. I’ve updated my profile. I’m amazed at just how many places I’m starting to see credit card through a cellphone portable scanners being used. Sort of makes me question the security for those of us not in the practice of “really” doing a close watch of our statements. Need to beef it up to more than just monthly statement time perhaps?